Hello style lovers! Let’s talk about the ruffled sleeves trend. I know you have seen these bold ruffles all year on the runways to your favorite retail stores. 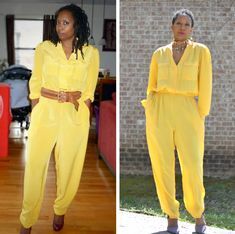 If you are not a fan, sad to break it to you that this trend is here to stay for the fall and winter season. 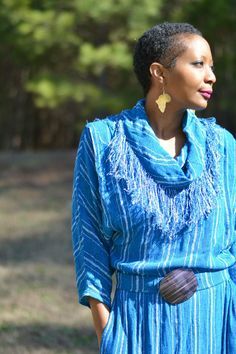 If you have already gotten on board, then read on if you want to master the art of wearing these 70’s inspired sleeves. Once relegated to your grandma’s outdated wardrobe, bold frills and ruffles are making a comeback, but thankfully, with a modern twist that can easily work for every and any occasion. Now, I will admit, pulling off these statement sleeves can be tricky. If not done correctly, you can certainly look clownish. But, paired with the right pieces, you will look amazingly stylish, polished and oh so chic. I have to say that I am in love with this trend. I will tell you why. These bold sleeves simply stands out. I am all about having unique pieces that makes a statement without me even having to say a word. Additionally, tops with dramatic sleeve adds more character to the look and can take a casual outfit to an exceptional look. If you want to give this trend a go, start out with neutrals, so that the texture and layers can do all the talking. Because this trend can add lots of volume to your look, my favorite way to wear the trend is to pair ruffles with a sleeker bottom piece, like a great pair of skinny jeans, a mini skirt, or leg-lengthening heels if you’re wearing a dress. 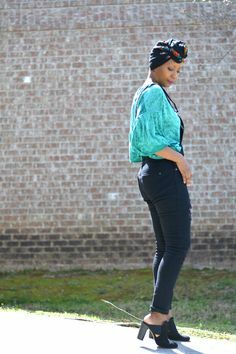 In this post, I paired my ruffle sleeve top with these tapered leg pants. In general, you should try to keep the focus on the sleeves and go for a minimal look with your other pieces. I found this gorgeous gingham ruffled blouse from Shein.com for $21. A great price for a great piece wouldn’t you agree? I love the gingham print as an alternative and welcomed second option to stripes. As mentioned above, I paired the ruffle blouse with these tapered white slacks from Express for under $30 on sale. It came with it’s own cloth belt, but for this look, I opted for my black leather belt that I got from an estate sale for $1. I completed this look with this gorgeous floral clutch. I have had this clutch for years now, and it still is a staple in my wardrobe for print mixing. I found this $6 clutch online at Aliexpress. While I have ordered from them sparingly, I absolutely love this clutch. Since black and white always goes well with a pop of red, I opted for my black and red thrifted Nine West pumps. I thrifted these pumps for $9 at a Goodwill in San Diego. Have you reached for a ruffled blouse yet? I love the whole look! This trend is something that I have embraced, it’s feminine and classy especially when paired with the right bottoms. I think you did an amazing job styling this blouse! That shirt looks amazing on you. I love this look, but never would have really looked twice at it on a hanger. On a real person though, it makes me want to pick one up! I love making a statement without saying a word. I’ve seen the ruffled sleeves in the stores but have been nervous to try it. Absolutely love how you’ve styled it. I agree with you. I’d never try this, but here, it looks amazing. I love gingham print in general so much more than I do stripes. I love the feminine ruffle touch to this. You could totally dress this top up or down. I have not tried the ruffled arm look yet. You make it look great. Love that print as well! The blouse, and in particular, the sleeves, are really pretty! They are feminine and yet substantial. They don’t make one come off weak. The whole assemble is lovely. Your photo shoots are so fabulous!! And your outfits are too, love the ruffles! i love the outfit you put together! it is classic with a touch of feminine flirty! this post has totally inspired me to dive into the world of ruffles! I haven’t found the perfect ruffled blouse yet, but I am on the hunt. I do love the bell sleeve look and have already incorporated that into my fall wardrobe. I love pairing it with a sleeker bottom to call attention the top. I absolutely love this! The entire outfit looks effortless. I love that you got your ruffled sleeved shirt for only $21. When busying trendy, I definitely like to save. Especially since trends come and go, so I don’t need a piece built to last 10 years or something like that. The whole outfit is super cute. I’m a huge fan of ruffles and bell sleeves as well. You’ll see me wearing dresses with those most of the time. I am loving your outfit, it’s really pretty. You definitely wear it ‘like a boss’! I love how it looks on you and the whole outfit itself to be honest! You for sure wear this gorgeous and well. I am not a big fan of blouses in general, but i think I could really actually enjoy this one and look decent in it! I just love the whole look. It could gefor church, work, a meeting, whatever! It just works for all of those things. This looks perfect for the summer and you are definitely working this blouse! I love this shirt color and pattern for fall! Paired with bright pumps, it looks like a perfect sophisticated fall outfit. I hae never had any ruffled blouse. But that one really looks good. It fits on you. I absolutely love this look. That blouse is gorgeous, especially the sleeves.